The game of soccer continues to grow in Louisiana. Unfortunately, the corps of committed, knowledgeable and well-trained referees is not keeping pace. Quality referees are an essential part of player development. Becoming a referee is also an opportunity to earn a decent wage and all while maintaining a healthy lifestyle and making life-long friends. Referees and the laws of the game are administered through FIFA and US Soccer. Louisiana Soccer Association (LSA) appoints a State Referee Committee (SRC) to administer referee recruitment, education, registration and assignment across the state, but both LSA and its SRC simply act as the local arm of US Soccer. 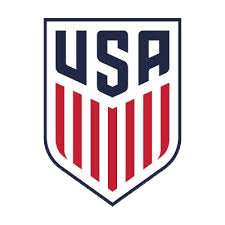 The visit the US Soccer Referee Program Page click the US Soccer shield below. Please Click Here for a list of currently scheduled courses in Louisiana. US Soccer has developed Online Training courses for its entry level referees.While these online training resources are specific to referee instruction, this content can also be accessed by players, coaches and spectators who simply want to learn more about the Laws of the Game and refereeing. Each Online Training Course targets the level of training for the referee in relation to the level of competition they will be officiating. Similar to Coaching Education, the US Soccer Online Training Courses start at the smaal-sided and recreational youth game and advance toward the amateur adult and pro game. Training for the Grade 9 Referee Course is specific to the small sided and recreational youth game. LSA and its SRC utilizes these targeted training materials to properly prepare officials to officiate games at this level of competition. La capacitación para el Curso de Árbitros de Grado 9 es específica para el juego juvenil de lado pequeño y recreativo. LSA y su SRC utilizan estos materiales de capacitación específicos para preparar adecuadamente a los funcionarios para oficiar juegos en este nivel de competencia.